HyperSnap is a simple screen capture tool for Windows which can capture either images or text from the Windows screen. HyperSnap features a high quality image editing program combined with their first class screen capturing utility. As an image editor combined with screen capture, HyperSnap is a perfect tool for grabbing images suitable for use in marketing, web pages, emails and powerpoint presentations. Another great utility of this program is the OCR-like functions which can capture text from your computer screen, the perfect companion for technical support requests as it can capture the text from error messages not selectable within the Windows interface. 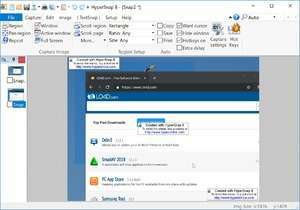 HyperSnap 8.16.10 is a shareware program and can be used as a demo to try the software until the free trial period has ended. A full version of the program is available after the trial period ends. For security reasons, you should also check out the HyperSnap download at LO4D.com which includes virus and malware tests. Additional screenshots of this application download may be available, too.